When you first wander into a music store to shop for an acoustic guitar, you are generally met with many choices. Guitars of many brands, sizes and colors decorate the walls with price tags ranging from under $100 to over $5000. What accounts for the disparity in prices? Although certain brands tend to fall into a particular price range and the country of origin can play a big factor, the main difference between models and their corresponding prices is their construction. Some of the construction differences involve mere cosmetics, such as the inlays on fretboard or designs on the pick guard. Another important factor is the quality of the components such as the tuners, nut, or bridge. These can definitely have an impact on both the sound and the price of the guitar. The major factor, however, is the wood being used. Many acoustics are made of solid wood. Others are made of laminate. Let’s compare them. A solid wood guitar has a back of heavier solid wood such as mahogany for deep rich tone, and a lighter wood such as spruce for the top. These pieces are glued together. Solid wood guitars are longer-lasting and have a richer tone than their laminate counterparts. They are also generally much more expensive. The laminate wood used in less-expensive guitars is constructed of thin layers of wood glued together. These woods are generally the same types of wood used to make solid wood models, so they usually look very similar cosmetically to their solid counterparts. Laminate guitars are typically less expensive. 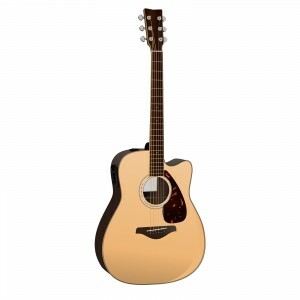 The vibration of the wood when the strings are struck is what gives the guitar its “voice,” or tone. Although they can also be very sturdy, glued sheets of wood simply can’t have the same vibrational quality as a solid piece of wood. This does not mean you should always buy solid wood. Many laminate models still sound very good. If you are a student or beginner, you may not know exactly what you want in a guitar. You may even decide in time that another instrument would be preferable to the guitar. Similarly, if you are on a tight budget, you may not be able to spend a lot of money on your first one. There is no shame in that. If you do your shopping carefully, you can find an inexpensive laminate model that will still give you a good sound. If you are looking for an upgrade, or you have sufficient funds and desire to take your playing to a higher level, then a solid wood model is recommended. Guitar manufacturers love to tell you that their solid wood models are just that. The accompanying rule of thumb is: If it doesn’t say that it’s solid wood, it generally isn’t. Merely stating the types of wood used in the manufacturing process doesn’t cut it; they may be laminate layers of the same wood. Ask your dealer if you have any questions. The best thing you can do for yourself, particularly if you are new, is go to a music store and try some different guitars. Which one (within your budget) sounds and feels the best to you? Whether it’s a solid wood acoustic or a laminate, the choice comes down to sound, feel, and what you will enjoy the most.